The image from lexjuris site is not very impressive. It shows the Coat of Arms of the capital of Puerto Ricoon a white field. On the homepage of San Juan <www.sanjuan.org> there is a small Coat of Arms, a slightly bigger Coat of Arms and ... no flag; there are long descriptions of Coat of Arms and flag(s?). I gather that there has been a 'najanjito' flag with the Coat of Arms and that there is a close connection between the Coat of Arms of Puerto Rico and San Juan. San Juan is on the north coast of Puerto Rico; the oldest part of the city was built on an island in a large bay which has a narrow entrance, connected with mainland by a causeway and bridges; there is the School of Tropical Medicine of the University of Puerto Rico. The site was first visited (1508) by Ponce de le'on who made a settlement (Caparra) 1509 on the mainland; in 1511 Caparra abandoned and site on the island settled; fortifications begun 1533, El Morro castle built 1539-84; attacked by Drake and Hawkins 1595; held by the British under Lord Clifford for a short time 1598; sacked by the Dutch 1625; attacked again unsuccessfully by British 1797; occupied by Americans 1898. There are 437,745 Sanjuaneros. The sanjuan.org site says: "Shield of the City of San Juan. The shield of the City of San Juan is very similar to that of Puerto Rico, both having as the principal charge the Lamb of God or Paschal Lamb, which represents Jesus Christ and St. John the Baptist. It was natural to place the Paschal Lamb on the shield of the island, which was originally called Island of St. John the Baptist, and on that of the capital. With the passage of time, "San Juan" came to be the name of the capital and "Puerto Rico" that of the island. St. John the Baptist is the patron saint of the city. The shield of San Juan is blue. The lamb is shown standing on a rock. This lamb represents, in the first place, Jesus Christ the Redeemer. It is for this reason that its head has a halo which carries the emblem of the cross. The flag carried by the lamb, silver or white with a red cross, represents the sacrifice of Christ on the cross and also His triumph, in the resurrection, over sin and death. The lamb moreover represents St. John the Baptist, prescursor of the Savior, who pointed out Christ saying: "Behold the Lamb of God, who takes away the sins of the world." The rock on which the lamb stands has a double significance. In the first place, it represents Mount Zion, symbol of the city of Jerusalem and the Church. The stream that flows from it represents the rivers of paradise and the sacraments, particularly baptism. In the second place, the rock placed on the waves of water represents the islet of San Juan, location of our capital. The mural crown is the emblem with which are adorned the shields of villages, towns, and cities, principally those that are or have been fortified or surrounded by walls, like San Juan. This shield represents a history of constancy and heroism. In the year 1799, King Charles IV of Spain, to reward the valor and fidelity shown by the sons of Puerto Rico on the occasion of the last English attack on San Juan (1797), granted the capital the privilege of surrounding its arms with the following motto: For her constancy, love, and fidelity, this city is very noble and loyal. For the 450th anniversary of the City of San Juan, and with the assistance of the Institute for Puerto Rican Culture, in 1971 the Municipal Assembly decided to reform the shield as well as the seal and official flag of the city. The ordinance provided that "the arms of the capital be purified of the elements that have been attached to it without historical or heraldic justification, that certain details be added which are undoubtedly merited, and that they se le añadan ciertos detalles de que indebidamente carece, and that they be given a character more in keeping with the simplicity and precision that characterize both ancient as well as contemporary heraldry." In this year the flag was changed to a "white rectangular field with the shield of arms on the center." The first flag of the capital city was officially adopted on March 8, 1948, by the Municipal Assembly. It was an entirely orange field, on the center of which were depicted the arms of the city. The color then given to the flag was based on a text of Don Diego de Torres Vargas, taken form his description of the city and island of Puerto Rico in the year 1647, which read: "Shield of arms granted to Puerto Rico by the Catholic Kings in the year 1511, an inhabitant named Pedro Moreno being the Procurator. They are: a white lamb with its red pennant, upon a book, and all on a green island, which is that of Puerto Rico, and on the sides an F and and I, which represent Fernando and Isabel, the Catholic Kings who granted them, and today remain on the royal standard, which is an orange damask, with which the city was won." Comment: The lamb resting on the book remains, I believe, the arms of the Commonwealth of Puerto Rico. Here's what's said at lexjuris site It's pretty much a condensed version of what's at the sanjuan.org site. The shield of the City of San Juan is very similar to that of Puerto Rico, both having as the principal charge the Lamb of God or Paschal Lamb, which represents Jesus Christ and St. John the Baptist. The shield represents a complete history of constancy and heroism. This is the one appearing in pueblos-de-puertorico and the one seen actually flying in the Capital City. It is interesting to me to see that the emblem on the flag for San Juan. That ram is holding a St. George's flag, which seems to me to represent England. Is there a story about this emblem? The Paschal lamb (not ram), or Lamb of God, has been an iconographic symbol of St. John the Baptist since very early times. Both Christ and St. John as well as the Lamb are frequently depicted carrying a white flag with a red cross on it. The association with St. George is, I believe, derivative if not coincidental. The blazon of the San Juan arms actually refers to the banner as that of St. John. This is the current shield as depicted in several official ads and in the actual flag flowing at the Hiram Bithorn Stadium gates. They are not new, the flag's been flowing since several years by now. San Juan City Coat of Arms - The city of San Juan started using a shield by the end of the XVI or the beginning of the XVII century in which the Pascal Lamb (named sometimes the San Juan Lamb) appeared as the main image. The shield differed in many ways to the Puerto Rican Arms: its background was blue instead of green; it has no orle or bordure; the lamb was standing in it over the book and this placed over a green isle rising from the sea; and, neither the F and initials, uncrowned, the ox-yoke nor the arrows appeared in or outside the shield. The differences may have been the result of either giving the capital city its own shield, dissimilar to the Island's, or an unfruitful effort in reproducing by way of memory the original shield of Puerto Rico. We have to remember that the city of San Juan was once called Puerto Rico of San Juan Bautista. As time went by, the differences between both shields were being accentuated. In the XVIII century: the book was concealed from the San Juan shield; the isle presents a bay or a spring flowing out, a symbol of baptism; the motto "Joannes est nomen eius" is added; and, the F and I (Latin I) initials are placed in or outside the blazon field, sometimes joined by the ox-yoke and the sheaf of arrows. The origin of this Coat of Arms is uncertain, we only know that it has been used for several centuries and that through time its design has undergone several modifications, none of them of great importance. The shield of the City of San Juan is very similar to the one of Puerto Rico. Both use as the main figure the Lamb of God or Paschal Lamb, which represents Jesus Christ and San Juan Baptist. 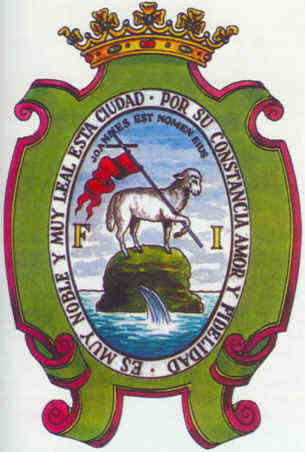 It was natural to use the Paschal Lamb in the shield of the Island - originally called Island of San Juan Baptist - and in the Capital's shield. With time, San Juan became the name of the Capital and Puerto Rico the Island's name. San Juan Baptist is also the Patron Saint of the City. The shield of San Juan is blue. The lamb appears standing on a rock. This lamb represents, first, Jesus Christ Redeemer, which is the reason it has an aureole with a cross above its head. The silver-plated or white flag with a red cross, carried by the lamb, represents Christ's sacrifice at the cross and his resurrection and triumph over sin and death. Additionally, the lamb represents San Juan Baptist, precursor of the Savoir because San Juan Baptist was the one who signaled to Christ saying: "Here is the Savoir, who cleanses the world of sin". The rock on which the Lamb stands has a double meaning. It represents: firstly, Mount Sion, symbol of the holy city of Jerusalem and the Church with the spring that flows representing the rivers of Paradise and the Sacraments, particularly baptism; secondly, it shows the rock on waves of water representing the isle on which our capital, San Juan, stands. The mural crown is the emblem adorning the shields of towns, villas and cities, mainly those that are or were fortified, surrounded by walls like San Juan. This shield represents a history of constancy and valor. In the year 1799 King Charles IV of Spain, in appreciation of the value and fidelity shown by the citizens of Puerto Rico on the occasion of an English attack upon San Juan in 1797, granted the city the privilege to trim the Coat of Arms with the following motto: "POR SU CONSTANCIA, AMOR Y FIDELIDAD, ES MUY NOBLE Y MUY LEAL ESTA CIUDAD" (For constancy, love and fidelity, this city is very noble and very loyal). I mentioned some photocopies that I saw describing the San Juan's shield. These belong to the softbound book "Los Símbolos Oficiales de Puerto Rico", by Editorial Cordillera. Here is the San Juan City Coat of Arms for the XIX Century as painted by José Campeche, one of our most prestigious painters of that time. A slight version of it can be seen in Manuel Gabino's recent collaboration about the San Juan Flag at 10th Central-American and Caribbean Games, held in that city in 1966. Most porbably, that flag was hastily made for the games. 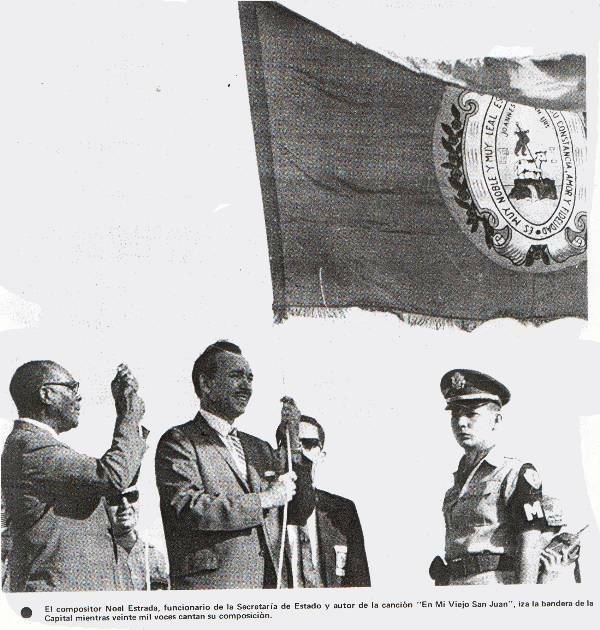 I am reporting about the flag of San Juan as hoisted during the "X Juegos Deportivos Centroamericanos y del Caribe" ('Tenth Central-American and Caribbean Games) in 1966. The work is all in Spanish, so that the translation (by myself) is unofficial. The images are in black and white. The photo of the San Juan flag appears in the page 13 of the volume 1. The foot reads: "El compositor Noel Estrada, funcionario de la Secretaría de Estado y autor de la canción 'En Mi Viejo San Juan' iza la bandera de la Capital mientras veinte mil voces cantan su coposición" [Song-writer Noel Estrada, officer of the State Department and writer of the song 'En Mi Viejo San Juan' (In my old San Juan), hoists the Capital's flag while twenty thousand voices sing his song]. The photo, a very good image, depicts the flag all but white. The flag seems to be blue (?) instead. The San Juan arms over all the center within an oval, perhaps red or orange or green (compared to the other photos). The coat of arms is in an old (?) version; it is a white oval ring bearing the motto: "es muy noble y muy leal es[ta ciudad por] su constacia, amor y fidelidad", in black (?) capital letters. The ring in turn surrounds the lamb looking towards the letter "I" (then to the fly). Above the lamb, following the upper inner edge of the oval ring, there is the inscription: "joannes [est nom]en ejus" in capital letters. The field appears over a mantling, that in turn, is over a garland. The whole as I said before is within an oval. The flag has a fringe also. Source: "Memoria de los Décimos Juegos Deportivos Centroamericos y del Caribe" Administración de Parques y Recreo Públicos del Estado Libre Asociado de Puerto Rico, 1966. Two volumes. In the cover: A photo of the Games flag. Emblem of the Comité Olímpico Puertorriqueño (COPR). Index. Official Puerto-Rican coat of arms.